Main menue is slowest way to access commands. Command line is the fastest way. Command line promts what will be the next step. Tab-bar: standard tab-bar has all basics. 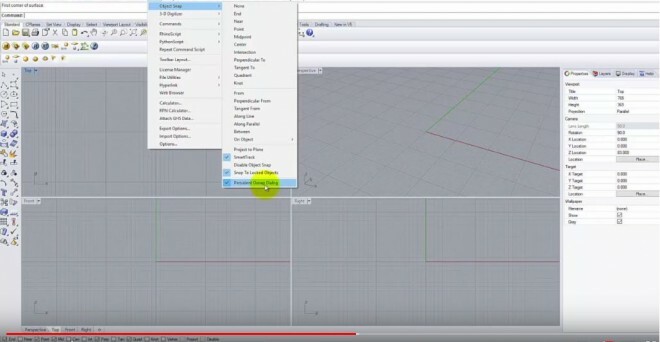 Left toolbar: all tool buttons with subtools. Use ESC to exit all functions. 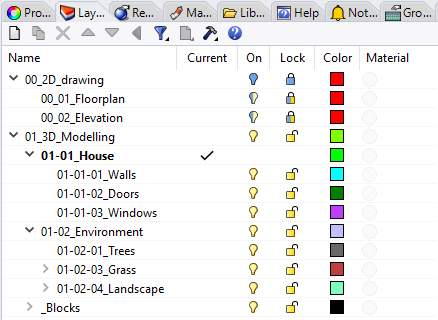 Right toolbar: Properties + help-window. Osnap-dialog lower area: (check “tools/object snap/persistance objectsnap: on”). CMD “Units” to get to Document properties/Units/Model. Draw rectangle as square (CMD: @5,5) Make surface out of curve: CMD “Patch” (Surface U/V spans = 2). Viewport “shaded” to see surface. 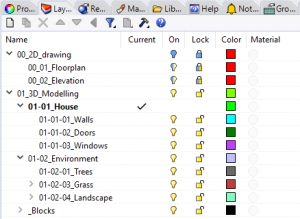 How to select objects on top of each other. Draw vertical curve (surface) on surface: CMD “rectangle”, set “first corner of rectangle:” vertical. Draw rectangular surface like curve just allready as surface without CMD “Patch” as vertical plane. Draw triangular surfaces: 1. as polyline-tool and add CMD patch 2. as surface tool and only use 3 corner points. 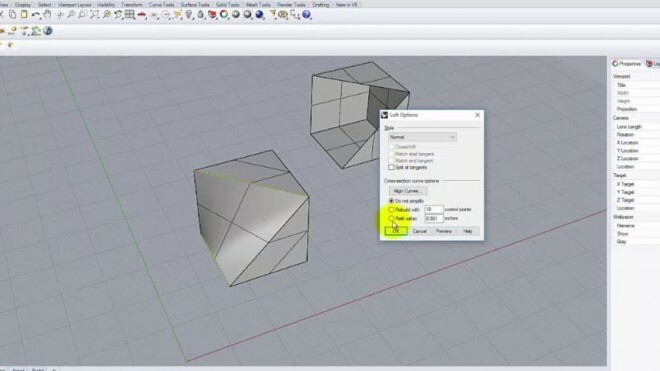 Viewport and coordinate system: Rhino is a vector based programm (XYZ). You can enter X/Yfor polyline and also X/Y/Z coordinates. Polyline-tool: CMD “Poly”, enter X,Y and draw poylines, use ortho-snap (X=red, Y=green, Z=blue). Enter absolute mode (3,5) and relative mode (@3,5). Close curves with (“C”).